On This Date: In 1947, Jackie Robinson made his MLB debut for the Dodgers, changing the game forever. Just like every year, Major League Baseball is in the midst of celebrating the life and legacy of the hall of famer who is responsible for the game moving forward despite everything he had to go through during his heyday. 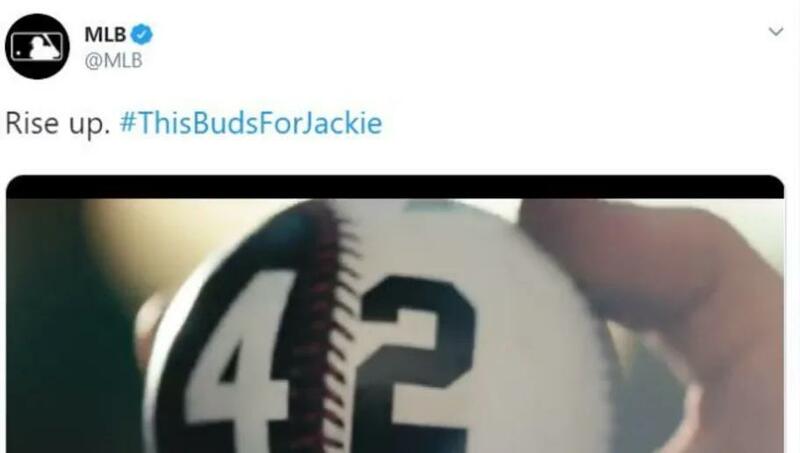 In doing so, the MLB official Twitter account decided it would be a grand idea to tweet out a Budweiser commercial with the hashtag #ThisBudsForJackie and it did not go over well. I guess(?) it's good that @MLB deleted the Drink A Budweiser Because Jakie Robinson Would Want You To ad but good lord how did it get through every single person who signed off on this idea? MLB deleted that Jackie Robinson Budweiser tweet already. Took about 45 mins. Through this campaign—celebrating what would have been Robinson’s 100th birthday—42 cents from every bottle sold during the 2019 MLB season will be donated to the Jackie Robinson Foundation to help support the Jackie Robinson Museum opening in New York City this year. Along with the limited edition bottles, Budweiser collaborated with Oscar-winning director Spike Lee to create “Impact,” a film narrated by Robinson’s daughter, Sharon, to spotlight the color barriers the baseball icon broke after years of segregation.